They believed the Drive-By Media, who, by the way, leads them. They believed the Drive-By Media polls. They believed all of the stories about Trump and his boorishness, and they believed that the American people were repulsed by it and were rejecting it. And they ignored 20,000, 25,000 at Trump rallies as insignificant, inconsequential, crowd size doesn’t matter at all in politics. And they weren’t just lied to for a couple of weeks; they were lied to for the entire campaign. Even during the Podesta email meltdown, even during the WikiLeaks, all of this they were repeatedly assured, they were guaranteed. Nate Silver is out there saying, “Oh, yeah, 85, 90% chance Hillary wins.” They believed it lock, stock, and barrel. They thought it was a slam dunk. They were lied to. Their own media set them up. Their own media lied to them. Their own media told stories they hoped would end up being true. They reported things that were not true that they hoped people would believe about Trump. They assured their own supporters that there was no way Trump could win. This was gonna be an historic landslide and a great victory for the Democrats, the first woman ever to crack the glass ceiling in politics and head all the way into the Oval Office, even though Mrs. Clinton has shown no evidence of such electoral prominence and victory, other than her Senate seat in New York, which Democrats don’t lose in New York. But then the unexpected happened, the inexplicable, the impossible, and Donald Trump did win. And in the Electoral College, it was handily won. So what happened next? Twenty-four hours later a narrative was recreated, and that narrative was that the Russians colluded with Trump to steal the election from Hillary, that the Russians hacked our elections, that the Russians stole the election, the election was commandeered by Trump working with Putin. The Democrat Party picked up the story and ran with it, the Drive-By Media picked up the story and ran with it all during the transition to the point that everybody in the Democrat Party in the country to this day really believes that there was collusion. They really believe that Trump stole the election working with Putin. They have been convinced because they’ve been lied to. They believe it. It is not their ideology leading them to this belief. It is not their desire. They’ve been told. Their media everywhere, New York Times, Washington Post, CNN, NBC, ABC, CBS, MSNBC, the Los Angeles Times, multiple times a day since November the 10th have been telling the people of this country the election was stolen, it was corrupted by Trump and the Russians. During the transition, additional sources were added from the deep state. Anonymous sources, intelligence community sources who said that the evidence they were looking — uh, sorry — they weren’t looking at evidence. There were reports, there were leaks, there were suspicions. By the time we get to the present day, how many anonymous sources since last November alone must there have been pushing this lie? The New York Times reports — maybe it’s the Washington Post — one of the two, 30 different anonymous sources on this one story, one newspaper. This lie has been told over and over again. It has been buttressed, it has been supplanted, it has been expanded. There are more anonymous sources. There are additional sources now from overseas. We had that fake dossier that was treated as real by the Drive-By Media. So there are some literally dangerously imbalanced leftists who are already protesting and causing threats and riots at town halls. The FCC director has people peering into his windows trying to get an idea of the layout of his home. This is Ajit Pai. The Democrat Party, the American media, has literally created an insane asylum that has no walls. And the people in this insane asylum, who are genuinely, truly unbalanced, have been made this way by having been fed a diet of raw hatred for the last nine months. Now, of course they’ve been fed this raw hatred for decades. But in the intense specifics of this election and the collusion with the Russians, they have been fed lies and distortions and rumors as fact. They have created a brimming, a burgeoning, an effervescing, raw hatred that has yet had no outlet for expression. It’s bubbling up and it’s waiting to explode. And the Democrats are scared to death of the day they have to make it official: There was no collusion, there was no evidence, there will be no impeachment. That’s why they’re trying to walk back impeachment, ’cause they’re scared to death of what they’ve created. They can’t control it. It is an uncorralled monster of genuine insane lunatics that is the Democrat base. RUSH: Not to overstress this, but I think it’s crucially important. I’ll give you another example in just a second here. Just to reiterate. The media, which runs the left now, not just in this country, but around the world, the media has lied to the Democrats via their polling and via their reporting. They’ve lied repeatedly over who was going to win the election, and then when the election didn’t go the way they said it was gonna go, they’re now lying about the election being stolen by Trump and the Russians. They have compounded the lie and they have ostensibly supplied evidence when there isn’t any. And they have created a tremendous number of genuinely enraged, seriously unbalanced mentally people that make up the Democrat voter base who are convinced — they’re expecting Trump to be impeached. They’re expecting the Democrats and the media to destroy Trump. They’re expecting that with every witness that’s called, Sally Yates was gonna drop the bombshell. Do you remember when the media was even shocked that Yates really had nothing to add to anything? And I remember when I saw it, why wouldn’t they know? She’s got nothing. Do they think that she’s been withholding bombshell news for all of these weeks until it was time to testify and then she’s gonna let fly? I mean, the media genuinely seemed saddened that she didn’t have anything. And I’m asking myself, how can they not know? She’s on their team. She’s got lawyers. She is a lawyer. There’s gotta be somebody that can convey from her to the media and everybody else, “Hey, gang, there’s nothing here. Trump hasn’t committed a crime. We don’t have any evidence.” But she went up there and they were fully expecting the bombshell. They’re expecting Comey to unveil every bit of evidence he’s collected in his investigation. They’re expecting Trump to go down this week. They were expecting Trump to go down last week. They’re expecting Trump to go down next week. They’re expecting somebody’s gonna come along here and drop the bomb of evidence because they’ve been told it’s there. But the Democrats know there’s no evidence. They know they’ve been lying to their people. The media knows it. So it’s walk-back time. That’s why all this gotta be careful, gotta walk back this talk of impeachment because there isn’t, there is not a crime that has been committed. So there is real fear of what these people are gonna do when that fateful day comes that everybody has to say no evidence and no impeachment and no collusion. They just can’t come out and say that, or they’re gonna have nation — you think they were rioting now, we don’t have any idea what’s gonna happen when these people once again realize they’ve been lied to and misled. The election was the first, and now this? Democrats and the media are genuinely concerned, because they’ve created this insanity. So the addendum, the Notre Dame speech by the vice president, Mike Pence, about 3,100 people, students, I guess it was. I’m not sure what that number comprises, if it’s graduates and families, if it’s the total number in the stadium or whatever. Bottom line, that’s the number I was given or saw. Seventy-five of ’em walked out. They were booed by the people. The parents of these 75 did not walk out. Yet the media portrayed this as something the exact opposite. The media portrayed it as the entire graduating class walked out, that everybody turned their back on Pence and left and that Pence was left with an empty stadium to speak to, right? Well, stick with me on this. That’s what they think happened, the people who were not there. That’s an example of the lying and the exaggeration that’s taking place. So it created a tweet out there, meathead, Rob Reiner, he tweeted, “We all need to follow the example of the Notre Dame grads and walk away from the most corrupt administration in our lifetime.” And he’s got a hashtag, #TrumpRussia. That’s why they’re the most corrupt. Meathead doesn’t know the truth. Meathead has a fallen for the lie. Meathead believes there’s collusion. So what do we have here? We have on the one hand reality: A paltry 75 people whimper out of there. Their parents didn’t go. The speech went on. It was it not interrupted. It was not deterred. The vast majority of people stayed, all the parents stayed. On the other hand, a bunch of people in this country believe an outright lie once again, reported by the media. Now, which is more important, folks, at the end of the day, the truth and what really happened there and the people who were there and know the truth or the big lie over here? Will there be a reckoning? At some point. This is just a microcosm of what has been happening. A total lie. Except it didn’t happen. It’s not uncommon. I mean, there’s examples of this every day, reality versus reporting. But there will be a reckoning on this stuff. The things that they believe are not happening, the things that they believed happened didn’t, they are being lied to. You would think at some point some of them would start to figure this out. Lied to about the election. Lied to about 2010, 2012, 2014 midterms, lied to about the presidential race. But they don’t do that, do they? They don’t think they’re being lied to. They think things are being stolen from them or things are corrupt or what have you. But it’s dangerous because the entire Democrat base — which includes New York City. (chuckles) These judges! Look at these judges that put the stay on Trump’s two executive orders limiting travel. Why’d they do it? Well, it’s not because the executive order’s unconstitutional, because both of them are. Both of them. Trump is the executive branch. Trump can do it. Do you know Trump fire Mueller if he wants to? 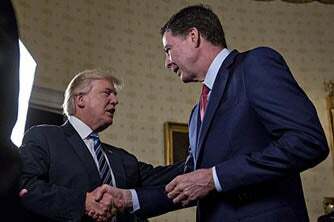 Trump can fire the independent counsel. Trump can fire anybody. Trump is the executive branch, and these investigations are all gonna happen under the purview of the executive branch. He has total power. He doesn’t have some of the power. He doesn’t have a little bit of the power. The president has all of the power of the executive branch, every ounce of it. Scalia has so stated in a Supreme Court… It was actually a dissent in a ruling on the executive counsel law, which everybody has since agreed that Scalia was right and ’cause there can be no… The president doesn’t have a little bit of power, some power. It’s not that he shares it with the attorney general. The judiciary doesn’t get some of his power; he doesn’t get some of theirs. The executive branch doesn’t get some of the legislative branch’s power. His is exclusive to him, the executive branch. He runs it, the president. Not just Trump, but the president. He can fire an independent counsel or an FBI director any day, any time he wants for no reason. He does not have to give anybody a reason. But that’s a side bar. Go back to these judges. The judges did not rule on Trump’s executive orders and the merits of the law. You know what they did? They said, “Well, we remember Trump during the campaign said he wanted to ban all Muslims from America. “That means Trump is a bigot! That means Trump is a pervert! That means Trump is anti-religious! That means Trump is just… (sputtering) He’s a pig, he’s a horrible person.” And we said, “We never heard of judges concocting rulings on statements candidates made during a campaign.” Okay, now, how does what those clowns believe…? Those judges are also part of the insane left, a product of lies and misinformation for who knows how many years now. The lies and misinformation about Republicans, about conservatives that these people believe! These are among the cream of the crop. These are judicial scholars, essentially, these judges. They are not rabble. They are elites. And they believe this stuff! They believe lies. How do their rulings about Trump’s statement on the campaign hating Muslims, square with these past two days? Trump hates Muslims? Trump wants to ban all Muslims? Trump is a bigot? Trump…? How does this square? It doesn’t. On the one hand, we have reality. On the other, we have liberalism. We have the left. And there isn’t any common ground here. And I’m just telling you: If Trump sticks to his guns, the day of reckoning is gonna come for them, not for him. If he sticks to his guns. Because there’s an entire majority of this country who is with Trump but are not insane. They are not lunatics, they have not been lied to, and they (to date) have not abandoned Trump. Things built on false foundations — I don’t care what they are — the foundation crumbles. A flood, an earthquake, too much weight. And I’m telling you, everything the left is building on its foundation is flimsy because the foundation is nothing but lies and distortions. It’s like Ronaldus Magnus believed that the Soviet Union would eventually implode on the weight of its own immorality. This kind of lying, stinking disinformation is not the kind of thing that is triumphant. It’s destroying these people. It’s eating them alive. Raw, great hatred and rage is literally eating them alive. You’ll see. Stick with this long enough and they’re gonna subsume themselves. RUSH: You know, I have some audio sound bites here on all these Democrats walking back impeachment; I didn’t get to ’em. Maybe I’ll save ’em for tomorrow. I also have a whole Stack here on the Democrat Party cracking up, primarily in California, but everywhere. The state California Democratic leader is a guy named John Burton, and he led a charge at the Democrat Party convention with the F-bomb with the middle finger extended. “F— Donald Trump!” He got thousands of people standing to say, “F— Donald Trump!” with their middle fingers extended. Something about the F-bomb and other obscenities is becoming standard, ordinary, everyday operating fare for today’s Democrats. Here we have John Podesta calling the Comey firing “laughable.” He’s continuing to blame Comey for the Clinton election loss but still mad that Comey got fired. He’s losing his mind about what happened, and he’s out there claiming he was a victim of a Russian hack, and he wasn’t. Tom Perez, who head the Democrat National Committee, was heckled when he spoke to California Democrats, because he wasn’t obscene enough. He wasn’t ludicrous left-wing extreme enough, and this guy is setting records for extremism. This is the same place where the California Democratic Party chairman is telling protesters, “Shut the F— up,” when he was speaking.